A recent issue was reported at Apache CXF to do with the inability to process certain WS-Security requests that were generated by Metro or .NET when MTOM was enabled. In this case, Metro and .NET avoid BASE-64 encoding bytes and inserting them directly into the message (e.g. for BinarySecurityTokens or the CipherValue data associated with EncryptedData or EncryptedKey Elements). Instead the raw bytes are stored in a message attachment, and referred to in the message via xop:Include. Support for processing these types of requests has been added for WSS4J 2.0.5 and 2.1.2. In addition, CXF 3.1.2 now has the ability to avoid the BASE-64 encoding step when creating requests when MTOM is enabled, something that we will look at in this post. The advantage of this is that is marginally more efficient due to avoiding BASE-64 encoding at the sending side, and BASE-64 decoding on the receiving side. storeBytesInAttachment: Whether to store bytes (CipherData or BinarySecurityToken) in an attachment. The default is false, meaning that bytes are BASE-64 encoded and "inlined" in the message. WSS4J is stack-neutral, meaning that it has no concept of what a message attachment actually is. So for this to work, a CallbackHandler must be set on the RequestData Object, that knows how to retrieve attachments, as well as write modified/new attachments out. If you are using Apache CXF then this is taken care for you automatically. expandXOPIncludeForSignature: Whether to expand xop:Include Elements encountered when verifying a Signature. The default is true, meaning that the relevant attachment bytes are BASE-64 encoded and inserted into the Element. This ensures that the actual bytes are signed, and not just the reference. So for example, if an encrypted SOAP Body is signed, the default behaviour is to expand the xop:Include Element to make sure that we are verifying the signature on the SOAP Body. On the sending side, we must have a signature action *before* an encryption action, for this same reason. If we encrypt before signing, then WSS4J will turn off the "storeBytesInAttachment" property, to make sure that we are not signing a reference. ws-security.store.bytes.in.attachment: Whether to store bytes (CipherData or BinarySecurityToken) in an attachment. The default is true if MTOM is enabled. If sp:ProtectTokens is present. In this case, the signing cert is itself signed, and again we want to avoid signing a reference rather than the certificate bytes. This is the fourth in a series of blog posts on the new features and changes in Apache CXF Fediz 1.2.0. The last two articles focused on how clients can authenticate to the IdP in Fediz 1.2.0 using Kerberos and TLS client authentication. In this post we will divert our attention from the IdP for the time being, and look at a new container-independent Relying Party (RP) plugin available in Fediz 1.2.0 based on Apache CXF. The CXF plugin referred to here was not a full WS-Federation RP plugin as in the other modules. Instead, it consisted of a mechanism that allows the SSO (SAML) token retrieved as part of the WS-Federation process to be used by CXF client code, if the web application needed to obtain another token "on behalf of" the other token when making some subsequent web services call. 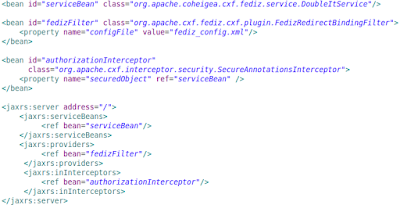 cxf-fediz-federation-sso: This project shows how to use the new CXF plugin of Apache Fediz 1.2.0 to authenticate and authorize clients of a JAX-RS service using WS-Federation. The test-case consists of two modules. The first is a web application which contains a simple JAX-RS service, which has a single GET method to return a doubled number. The method is secured with a @RolesAllowed annotation, meaning that only a user in roles "User", "Admin", or "Manager" can access the service. It's as easy as this to secure your CXF JAX-RS service using WS-Federation! The remaining module in the test above deploys the IdP + STS from Fediz in Apache Tomcat. It then takes the "double-it" war above and also deployed it in Tomcat. Finally, it uses Htmlunit to make an invocation on the service, and checks that access is granted to the service. Alternatively, you can comment the @Ignore annotation of the "testInBrowser" method, and copy the printed out URL into a browser to test the service directly (user credentials: "alice/ecila"). 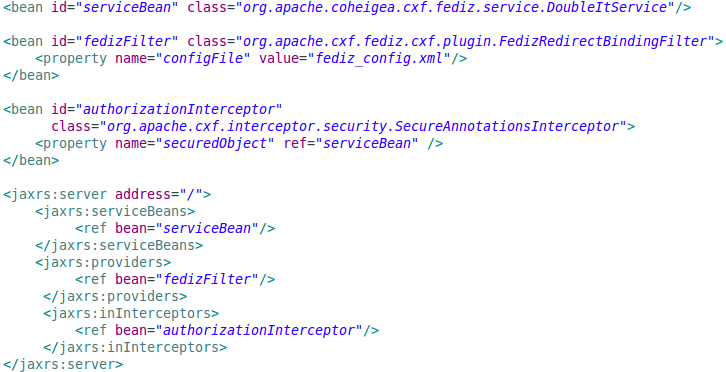 This is the third in a series of blog posts on the new features and changes in Apache CXF Fediz 1.2.0. The previous blog entry described how different client authentication mechanisms are supported in the IdP, and how to configure client authentication via an X.509 certificate, a new feature in Fediz 1.2.0. Another new authentication mechanism in Fediz 1.2.0 is the ability to authenticate to the IdP using Kerberos, which we will cover in this article. When the IdP receives a request at the URL path configured for Kerberos, it sends back a request for a Negotiate Authorization header if none is present. Otherwise it parses the header and BASE-64 decodes the Kerberos token and dispatches it to the configured authentication provider. Kerberos tokens are authenticated in the IdP via the STSKrbAuthenticationProvider, which is configured in the Spring security-config.xml. Passthrough Authentication. Here we do not authenticate the Kerberos token at all in the IdP, but pass it through to the STS for authentication. This is similar to what is done for the Username/Password authentication case. The default security binding of the STS for this scenario requires a KerberosToken Supporting Token. This is the default way of authenticating Kerberos tokens in the IdP. Delegation. If delegation is enabled in the IdP, then the received token is validated locally in the IdP. The delegated credential is then used to get a new Kerberos Token to authenticate the STS call "on behalf of" the original user. The previous post I wrote about how to integrate Apache CXF with Apache Camel. The basic test scenario involved using an Apache CXF proxy service to authenticate clients, and Apache Camel to route the authenticated requests to a backend service, which had different security requirements to the proxy. In this post, we will look at a slightly different scenario, where the duty of authenticating the clients shifts from the proxy service to Apache Camel itself. In addition, we will look at how to authorize the clients via different Apache Camel components. So now it is up to the Camel route to authenticate and authorize the user credentials. Here are two possibilities using Apache Shiro and Spring Security. camel-cxf-proxy-shiro-demo: Some authentication and authorization tests for an Apache CXF proxy service using the Apache Camel Shiro component. Note that the shiroHeaderProcessor bean processes the result from the proxy before applying the Shiro policy. This processor retrieves the client credentials (which are stored as a JAAS Subject in a header on the exchange) and extracts the username and password, storing them in special headers that are used by the Shiro component in Camel to get the username and password for authentication. camel-cxf-proxy-spring-security-demo: Some authentication and authorization tests for an Apache CXF proxy service using the Apache Camel Spring Security component. The Camel route is exactly the same as in the Shiro example above, except that a different processor implementation is used. The SpringSecurityHeaderProcessor bean used in the tests translates the user credentials into a Spring Security UsernamePasswordAuthenticationToken principal, which is added to the JAAS Subject stored under the Exchange.AUTHENTICATION header. This principal is then used by the Spring Security component to authenticate the request. Apache Camel provides support for integrating Apache CXF endpoints via the camel-cxf component. A common example of the benefits of using Apache Camel with webservices is when a proxy service is required to translate some client request into a format that is capable of being processed by some backend service. Apache Camel ships with an example where a backend service consumes SOAP over JMS, and a proxy service translates a SOAP over HTTP client request into SOAP over JMS. In this post, we will show an example of how to use this proxy pattern to secure a client invocation to a backend service via a proxy, when the backend service and proxy have different security requirements. The test scenario is as follows. The backend service is an Apache CXF-based JAX-WS "double-it" service that can only be called by trusted clients. However, we don't want to give the backend service the responsibility to authenticate clients. A CXF-based proxy service will be responsible for authenticating clients, and then routing the authenticated requests to the backend service via Apache Camel. The backend service is secured via TLS with client authentication, meaning that we have direct trust between the proxy service and the backend service. Clients must authenticate to the proxy service via a WS-Security UsernameToken over TLS. camel-cxf-proxy-demo: A secure proxy test using Apache CXF and Apache Camel. SSHTest: This test-case shows how to use the Apache Camel SSH component. The test fires up an Apache MINA SSHD server, which has been configured to allow authenticated users to execute arbitrary commands (ok not very safe...). Some files that contain unix commands are read in via a Camel route, executed using the SSH component, and the results are stored in target/ssh_results. SCPTest: This test-case shows how to use the Apache Camel JSCH component (which supports SCP using JSCH). An Apache MINA SSHD server is configured that allows SCP. Some XML files are read in via a Camel route, and copied using SCP to a target directory on the server (which maps to target/storage for the purposes of this test). SFTPTest: This test-case shows how to use the Apache Camel FTP component. An Apache MINA SSHD server is configured that allows SFTP. Some XML files are read in via a Camel route, and copied using SFTP to a target directory on the server (target/storage_sftp).